These videos crossed my desktop and I thought I would share. Too funny. Gotta watch. Well, I found some trails on an adventure run with Jim this summer. I was excited to show them to my running friends today. I love showing, and being shown new trails. Depart from Anmore, some road, up past Aspenwood school, to powerline road (turnaround of DV 50 km) .We head up a trail and cross a river. Thank goodness for the ropes cuz the rocks were icy and super slippery! Hands were pulling me across, feet were doing very little. I apologized for the ice and water, but thankfully my friends are tough and looked at it as an adventure. Off to some cool mountain bike trails, singing "deck the halls" , shot out into a pretty open trail. We hit a road they recognized and up they went... behind the mountain, and up towards Cypress lake, up thru the snowline. Part way up we took a single track trail down- back toward Buntzen , academy trail, and back home. A beautiful 3 hr circuit I must do again! And all this before noon !! After Jims stay at the hospital (hey, it was all inclusive), I thought I would take him down to Palm springs for a REAL holiday. It was Short and Sweet, but little did we know, we would hit their 'winter condition warning"
Oooh, high of 17-18 degrees Celcius (low 7-9) , 30 mph winds. They knew we were Canadian cuz we were the only ones in shorts! So instead of whining about the cold weather, we took advantage of cool things to do in the cool desert. Great weather for running, hiking, and SHOPPING! Cheap hotel that includes breakfast (that carried me till dinner). Cheap food, big portions. Cold weather forces us to ' Howard Hughes' hole up in the hotel... and hang out in the hot tub! Visit to dessert interpretation center... as dark looming clouds crept in. Cool Ironic views. Shopping at Palm Desert- too lavish for my budget!!! but really nice art shops. Saw some scary looking plastic surgery/ botox mishaps. AND BEAUTIFUL RAINBOWS IN THE DESERT !! Now thats special. I don't know when I will ever see that again! And, isn't that just life.... you can't have rainbows without a little rain. After volunteering at Fat Dog 100, I was given the added bonus of a free entrance to this run. Both events are put on by Mountain Madness http://www.mountainmadness.ca/races.php﻿. Volunteering rocks! And as you can see from the pic below- I definately had Fun ! ``runners high`` or what! Fun HILLS , beautiful run along the RIVER , MUDDY technical return﻿, and a sprint to the finish! 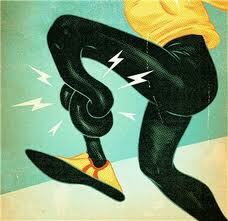 I practiced 50km pace, taking the hills slow at the start to keep my HR down and prevent calf cramping. As this is a 24 km, I was passed a LOT...so I picked it up the second half. I could not believe how much gas I had in the tank the last 4 miles. I will definately take this approach for my next 50 km though. At about 1.5 hrs in I had a lovely visit with girl representing ``save our skin`` . She was so nice, but I never got her name. She beat me in the end- thanks for that final push ! I liked that (other than top 3) results were not posted at the race...so could feel like I had a good run, based on how I felt, and not how I placed. YUMMY post race food! Potluck. -wish I had some of their recipes. The soup was sooo good! Best I`ve had in a long time. - Thank you Don Scott for not posting the horrible pic you took of me literally inhaling the soup- this one much better. It was a great fall reunion with many runners I met over the summer. I look forward to doing it again next year. He sends me off to the race, telling me `they are calling for freezing rain and hurricane force winds!`Funny. The next day : JIM takes me on an 8 mile `recovery run` to scope out some cool new trails in the heart of Belcarra forests, ending with a beautiful oceanside run. Its so nice to run with my husband again! I love his sense of adventure. 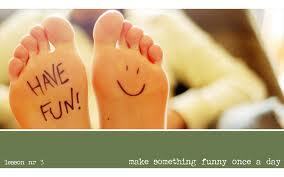 Half way thru the run, I`m hurting, but I had to tell him `` you`re fun !`` . Its amazing how quickly he is getting back into running. I had a hard time keeping up with him. This morning I opted out of a great hard training session with my usual group for an easy adventuresome run with my husband Jim as he recovers from illness. His first long run on the trails : -10 miles! 2 hrs+ . Yeah baby!! and all because it became an adventure finding new trails! Thank goodness I had my watch telling me we when to turn around cuz we could have gone forever! I missed out on a good hard training run, but appreciated an adventure run. It really did feel like I stopped running, and the world flowed by me. It was beautiful today. Getting Excited for Next Year! Three sucessful 50 km 's this year. Husband almost dies (but lived). Oldest daughter in university, youngest in middle school and competing in figure skating. Its been a busy year. I took 3 easy weeks hiking/easy runs with my husband. I enjoyed eating and drinking whatever I want and 'relaxing'. Not suprisingly so, this has gotten boring quite quickly. Thankfully, I have a great running group. As my husband is out of the loop (for now), I thought I would just do the same old local races . But my friends have better plans! yaay! I am so there! 1. I LOVE the team/ friend/social aspect of runs- so much more fun than running a race alone. 2. I need a new challenge to keep me 'honest' with myself. Apr 30- Capitopl peaks 50 mile - my first run exceeding 50Km and a gague for the death race. May 15 - Tenderfoot Boogie possibly.. 50 mile or 50 km . May be too close to 50 mile above though. 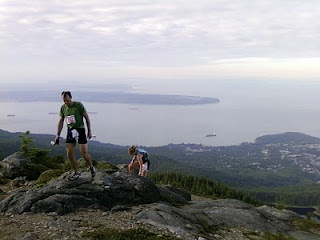 July 31 ish - Canadian Death race- 125 km, ...17000 ft elevation gain . I'm so scaaaared!!!/Excited!! Sept- Frosty mountain 50 Km. I have a bone to pick with this race. Haven't ran the whole thing. Its starting to look like an addiction. Like, 50 km isn't enough? I'm looking for more to satisfy my running 'fix' ! It wasn't even a race... just a nice long Sunday run with the gang. 45 minutes into a 3 hr run, hitting the second hill of ... Calf cramps! quad cramps! out of breath! WTF?? I felt fabulous otherwise (energy level etc), except that when I asked my legs to push me uphill... there was NOTHING there, like no blood was getting to my muscles. I bowed out, told the gang they would probably spend the rest of the run waiting for me. I went back downhill and ran relatively flat to finish out a 2 hr run. Hard to believe someone can feel like a loser only running 2 hours- but I did. Literally depressed at my performance, I spent 1/2 the day trying to find an explanation. The flu a week earlier ? Recent speedwork? Spending hours on a ladder?. "Why am I running if I end up mad at myself cuz I wasn't up to par one day?" 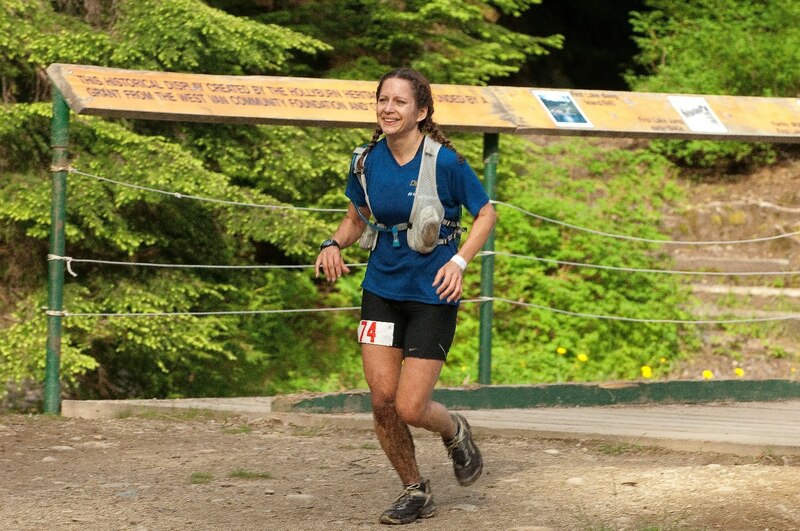 " I run for fun, for health, for adventure, personal accomplishment and socialization." Sometimes the fun gets lost in the seriousness of training. Race season is essentially over, so why not cross-train, take the pressure off and go have fun!!! I think I'll go buy some snowshoes... Look up a cool hike , ride my bike, and maybe even take a dip in the pool. RETURNING to this post I reealize how I need to chllax. I am back at it with the gang and am catching up. Why? AND I'm back doing core exercises. I am BACK on the WAGON!!!! the running wagon that is. Yeah baby !! What are you afraid of? How does it limit you from living your life to your fullest? My husband is recovering from a serious illness… which brought on this discussion. Was he afraid of yearly checkups for fear they might find something?? …. But had they found something, they may have prevented his current health issue!. There is food for thought…Wouldn’t you kick yourself if the doc finds something that could have been fixed a few years ago if you saw him then?? Get that physical! But it Expands from there- what else do you avoid because of fear? Some people never go enjoy the outdoors for fear of bears, pity! What they are missing!!! According to the wildlife research institute, people are 250 times more likely to be killed by lightning than a bear. The odds of being hit by lightning are 1 in 4.2 million. The odds of dying in a car accident are 1 in 20, 000. So put down the cell phone, put both hands on the wheel, quit worrying about bears! Well, that is definitely one of my fears- especially in the city. But when I added up all the great experiences I turned down because I was afraid to drive , it was again, a pity. I have since taken the wheel (albeit white knuckled) and have expanded my adventures outside of my little neighborhood. Doing so has expanded my life and independence- What a GREAT feeling! In my clinical experience I recently came across someone who admitted she was afraid of intimacy and rejection so she chose to be obese on purpose! (I’m talking 300+ lbs and had a stroke in her 30's) . She DENIED herself health and happiness, just because of her fears! Whoah, give your head a shake! and don’t let fear stand in your way!
" Only those who risk going TOO FAR can find out HOW FAR they can go” . TS Elliott -Love it! 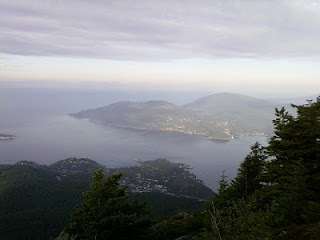 8000 ft elevation gain, 50 km. I can do that. Done it before. No problemo- or so I thought. Uphills so steep, I had to go on all 4's at times to pull myself up. I have callouses on my hands! 2-3 foot high steps at times, not condusive to my short little legs!! drunken, ankle-rolling game of hopscotch- staggering, slipping, and toe stubbing away. I can't give a detailed race report cuz I had no idea where I was most of the race! It was actually kinda trippy! But man, it was BEAUTIFUL!! I felt pretty chewed up by the time I was spat out of the mountains to the finish line. What was most impressive was the organizers and volunteers. Throughout this difficult course, I felt cared for, cheered on and safe the entire race! My Day of Firsts: Perfect for my FIRST Knee Knacker!!! First bad FALL in a race. Slipped on a root and slammed my shin on a rock on the first peak. Of course it had to be the leg with the steel plate- tawang! 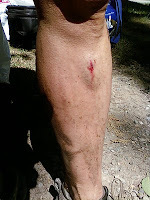 It swelled up and jiggled all the way down hollyburn chute- so I took it slow, which probably paid off in the end. Got to Ice it in the snow at mountain top. 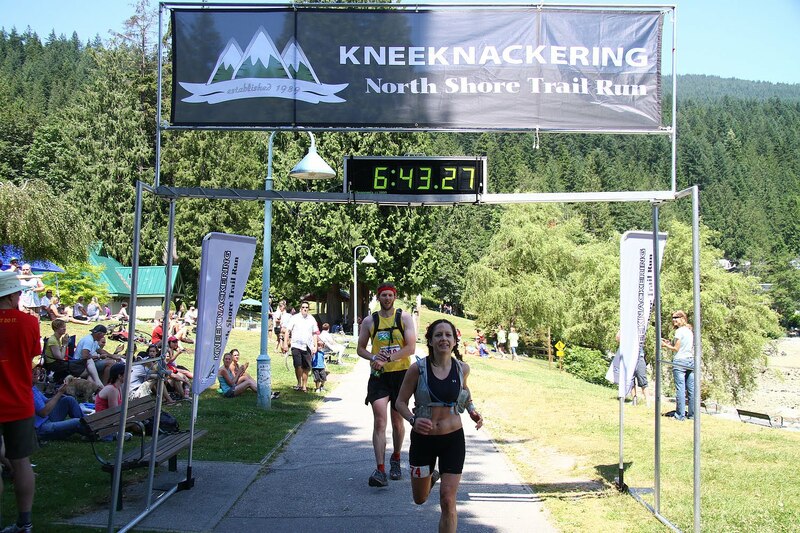 First 50K in the HEAT . I have new respect for my friends who ran the Sahara! First race without my running friends or husband (sad face) . Cross finish line, go 'yay me', then kinda walk around aimlessly. First time DRIVING 'in the city'. 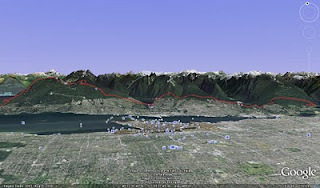 I spent more time researching/googlemapping the 45 km drive than I did the 50 km run!!! ha ha !! I'm almost more proud of my drive than my run! *Happy to destroy my sub 7 hr goal. *Disappointed in my slow down the last 7.5 mile stage of the race due to the heat. *Validated after looking at the results and seeing how many others crashed in the last 1/4 and were actually slower than me. I was actually 39th fastest finisher in this stage...should I have pushed harder? Still learning. *Disappointed in my 4th place finish. Damn, KK brings out great runners! 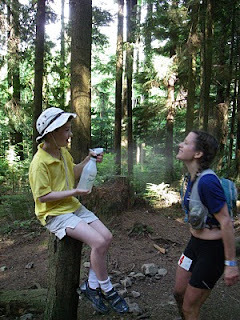 *Laughing at myself cuz at the end I encouraged a running colleague to giv'er. No worries, cuz she is in a younger age group than me....NOT.. apparently she turned 40 and took 3rd ! ha ha. I'm happy for her tho. *Sad cuz my running friends were not there to hang with after. *Grateful for the wonderful running community. Everyone is so nice and supportive! Wow, I wonder how someone feels after a 100Km/miler ?? Start: run, stop at trail, wait to get in-Bottleneck! First hill. Me trying to keep up with the 'big boys'. I look so little! This pic cracks me up!! Hollyburn and Cleveland dam (1/2 way). Its getting warmer... shirt rolled up, gut hanging out-but I don't care at this point. By the end, the shirt is off! Glad I planned for respectable gear underneath. Ahhh, some things are worth stopping for!! Place: 4th in age / 10th woman overall / 45th out of 206 overall. Pleased with the race, but see lots of room for improvement... after a rest of course!